On 25 July 2018, the Board of the National Trust of Australia (Victoria) resolved to classify Federation Square on the National Trust’s Register of Significant Places as a place of significance to the state of Victoria. Below is the approved statement of cultural heritage significance for Federation Square. We expect that further layers of significance will come to light as the place is assessed for possible inclusion in the Victorian Heritage Register. Federation Square is a public square designed by Lab Architecture Studio, led by Peter Davidson and Donald Bates, in association with Bates Smart, and was opened to the public on 26 October 2002. It occupies a site the size of a city block (3.8 hectares), bound by Flinders Street, Swanston Street, the Russell Street extension and Princes Walk which skirts the Yarra River, and is built above working rail lines that feed into Flinders Street Station. The site consists of a series of interlocking buildings, spaces and laneways, integrating public and civic spaces, commercial and retail tenancies and major cultural institutions including the Australian Centre for the Moving Image (ACMI) and SBS in the Alfred Deakin building on the north side, the Ian Potter Centre: NGV Australia to the east and the Koorie Heritage Trust in the Yarra Building to the south. The architectural and aesthetic significance of Federation Square depends on its presentation as a unified whole. The key elements of the site are outlined below, however the relationships between each element are also intrinsic to the significance of the place. Federation Square is built on a deck constructed over the Jolimont railyards, supported by steel beams, concrete ‘crash walls’, and vibration-absorbing spring coils and rubber padding. The Labyrinth is a maze of zig-zag surface corrugated concrete walls situated between the deck and the surface of the Square where the site slopes upward towards the Atrium. Covering an area of about 1600 square metres, the Labyrinth is almost 40×40 metres and 1.4 km in length, functioning as an environmentally friendly air-conditioning system that provides cool air to the Atrium, Deakin Edge and other parts of the Square in summer and warm air in winter. The Square is an irregularly shaped open space, sculpted to the rising ground levels required over the railway tracks below. A complex of buildings forms an irregular U-shape around the square, oriented to the west. The Square gradually rises approximately 6 metres from Swanston Street to the eastern end of the site, near the Atrium and the Ian Potter Centre: NGV Australia. The surface of the Square is made up of approximately 467,000 cobblestones of variegated coloured Kimberley sandstone from Mt Jowlaenga in Western Australia, which comprise the public artwork Nearamnew by Paul Carter. 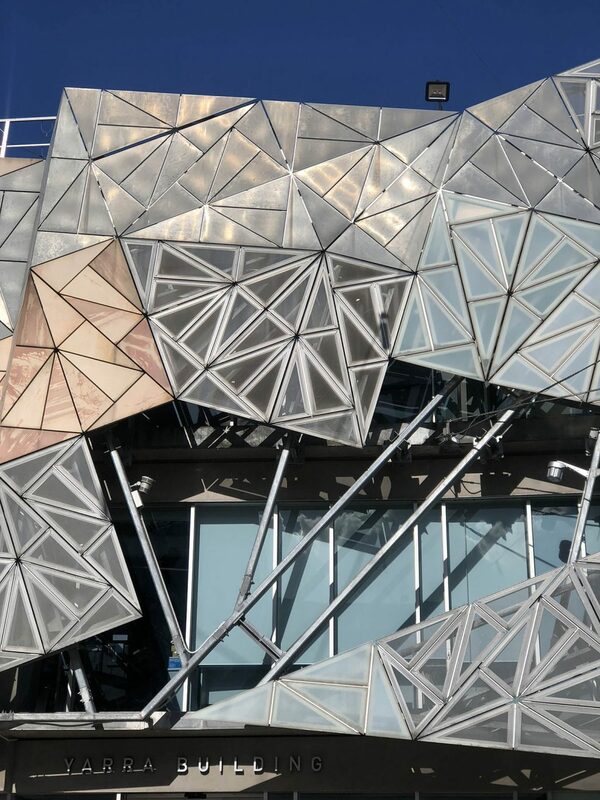 The work was commissioned by the Federation Square Public Art program and designed by public artist and academic Paul Carter in collaboration with Lab Architecture Studio. The artwork was created specifically for the Square to commemorate Federation, referencing the global, regional and local levels found in a federally organised society. The design consists of three parts inscribed into the cobbled surface: 1) the whorl pattern which forms the envelope of the design, 2) nine ground figures and 3) nine vision texts. The eastern end of the square is formed by the Atrium, which runs north-south from Flinders Street to the Yarra River walk, immediately to the west of the Ian Potter Centre: NGV Australia. It is a five-storey covered laneway or street constructed from glass and steel, and is a feature entry point into Federation Square from Flinders Street. At street level there are a collection of retail and hospitality outlets. Two-thirds of the way down the Atrium is the ‘Crossbar’, situated at an angle to both the Ian Potter Centre: NGV Australia and the Atrium, slicing through the two. The Crossbar acts as an entry point to the gallery, also facilitating the movement from the Atrium to the main Square. The western half of the Crossbar hosts restaurants at ground level and on the second-floor, as well as corporate offices in between. The Ian Potter Centre: NGV Australia is situated at the eastern end of Federation Square, stretching almost the whole block from Flinders Street down to the Yarra River walk. The gallery is designed as two north-south ‘filaments’, which form an angular and elongated figure of eight. The main entrance to the gallery and access to the three levels of the building are positions where the two filaments meet, at the Crossbar. The floor of this area is Kimberley sandstone which also paves the Square, creating a visual link with the rest of the precinct. At the southern end of the Atrium, with views through the glass wall to the Yarra River, is an indoor auditorium designed for music, lectures forums and presentations. It can seat up to 450 people. The interior is lined in wood veneer in geometrical patterns. The space was named BMW Edge until May 2013 until a new sponsorship deal with Deakin University led to the rebranding of the space as Deakin Edge. The Alfred Deakin building encloses the northern side of the Square, and consists of two large buildings joined by a glass central arcade. In 2018, the anchor tenants of the Alfred Deakin Building are the Australian Centre for the Moving Image (ACMI) and SBS. The eastern half of the building is a solid mass, containing two cinemas, a function room, retail space and café. The western half of the Alfred Deakin Building houses the administration of ACMI and the Melbourne headquarters of SBS. The arcade between the two parts of ACMI leads from Flinders Street into the Square. The Alfred Deakin building also includes a below-ground space on the Flinders Street side of the Square, which runs parallel to Flinders Street and the railway lines. This space, occupied by ACMI’s Screen Gallery, is utilised for screen-based exhibitions. The Screen Gallery was built in part of the space that once contained two platforms of the former Princes Bridge railway station. The Screen Gallery is 110 metres long, 15 metres wide and 8 metres high. There is a huge steel mezzanine floor which is retractable, allowing the Screen Gallery to have varying floor configurations. The Alfred Deakin building is connected to the Atrium by a small two storey building which currently has a hospitality use. The three-storey Yarra Building encloses the Square on its southern side, allowing people to move beside it down to the riverside walk on either side. The land around the Yarra Building slopes downhill to the river, and on both the eastern and western sides there are several flights of steps leading the pedestrian down. There are a number of cafes and restaurants at deck level, facing the river, and on the western side of the building. In 2018, the anchor tenant is the Koorie Heritage Trust, which relocated there in 2005. The Transport building is located at the south-western corner of Federation Square, adjoining Flinders Street and opposite the railway station and Princes Bridge, thus enclosing the Square on that side. A stage has been built on the side of the building facing the Square which, when in use, turns the space into an amphitheatre. On the eastern side of the building is an LED screen, which is a central element of the Square. The Screen showcases major events within the Square itself and from places elsewhere in Melbourne, across Australian and around the world, at various times of day and night. St Paul’s Court is a roughly triangular area of Federation Square directly opposite the twin steeples at the southern end of St Paul’s Cathedral. The corner of Federation Square opposite St Paul’s Cathedral at Swanston and Flinders Streets is the major gateway for pedestrians into Federation Square. Unlike the main Square, St Paul’s Court is not paved in sandstone cobbles; instead it is covered by bluestone and concrete pavers. The court’s surface rises from the street corner until it leads the visitor into the cobbled area and up a flight of steps into the Square. To the east there are commercial and retail outlets. The Swanston/Flinders Street corner of the site is occupied by the Western Shard, a glass-walled pavilion which provides access to the underground Melbourne Visitor Centre. The entrance features interactive news tickers in colour LEDs and small screens promoting current activities. The Eastern Shard is a zinc-clad building with a jagged and asymmetric outline. Slits of irregular shape act as windows and as a sculpture in the surface of the building. The distinctive slashed façade also flashes messages and electronic information about the Square and other news and events. The Eastern Shard is also the western buffer to the Flinders Street Amphitheatre. The Eastern Shard is the exit for the Melbourne Visitor Centre. A retail tenancy is housed in St Paul’s Court in the Eastern Shard. There are a small number of landscaped sections in the Square which are planted with Eucalyptus trees. There is also row of established Plane trees between the Yarra Building and Princes Walk. Three main spaces branch off the Square, including the Flinders Street Amphitheatre, St Paul’s Court, and the Swanston Street Forecourt. Each of these spaces focuses outwards, with a sloping gradient and seating, and feature a level change separating them from the Square. Criterion A: Importance to the course, or pattern, of Victoria’s cultural history. Criterion F: Importance in demonstrating a high degree of creative or technical achievement at a particular period. Criterion G: Strong or special association with a particular community or cultural group for social, cultural or spiritual reasons. This includes the significance of a place to Indigenous peoples as part of their continuing and developing cultural traditions. Melbourne has long searched for a Community Square along European lines. Founding Fathers and generations of community leaders supported the idea as essential to the City’s soul and indeed its “liveability”. The first attempt on Swanson Street involved the sacrifice of many important heritage buildings including The Queen Victoria Building and an ugly intrusion into The Plaza Theatre as a Shopping Arcade. Largely its failure was the result of its windswept location, its insufficient size and the sacrifice of public space to commercial interests. Ironically the site is now being better used as an international hotel and future Metro Station. The decision to remove The Gas & Fuel Buildings in Flinders Street and create a City Square was inspired. Despite being late by a year for Federation the buildings have become a community hub with hundreds of thousands flocking to the community tenants and outside activities. With the continuing expansion of Southbank with its residential and commercial towers, the redevelopment of Sturt St to the south and a new contemporary art gallery and the ongoing works & focus on the Sports Precinct to the East Federation Square has become the centre of Melbourne geographically and culturally. The existing buildings are a unified whole which unite the Square and provide focus to the activities – it juxtaposes architecturally in a stunning way with Flinders Street station to the West. Any destruction of part of the design would be wanton and damage the integrity of a successful public space. The fact that it is being done at the behest of a major international corporation who could locate anywhere in the City proves the value of the site as a people magnet and tourist drawcard. It must not go ahead.